Founded in Bristol in 1830 as J & G Gibbs ( who are also listed as “wire drawers at 4 Redcliff St )) and renamed in 1835 as G Gibbs . The firm has gained an impressive record of inovation, adaptation and tenacity! 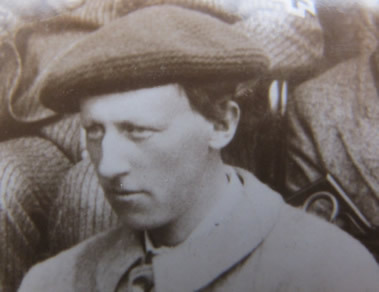 Making muzzle loading guns and rifles of the highest quality including Samuel Bakers first 4 bore heavy charge rifle, under the direction of the founder George Gibbs Snr. the firm developed and expanded with the help of his sons G.C. and Herbert to embrace the breechloading era with a series of crucial partnerships and designs. The firm finally consolidated in 1858 at 29 Corn St and this address changed to 39 Corn St in 1880 when St Werbergs church , further along Corn St , was dismantled and rebuilt elsewhere in the city . The Church was taken down during 1877 and replaced with 10 new shop premises , the buildings finally re numbered around 1879/1880. Many Gibbs guns and rifles of this period are simply engraved ” George Gibbs , Bristol ” as the firm did not seem to be clear what their address would be ! In rifles the partnership with W’m Metford and adoption of the Farquharson patent action made the most sucessful black powder falling block rifle of the 1870s and 80s, it swept all before it at the famous Wimbledon long range target meetings as well as stirling work amongst the game of Africa in the hands of F’rdk Selous, Arthur Neumann and Vaughn-Kirby. The Gibbs & Pitt shotgun was the first commercially sucessful breech loading shotgun patented in 1873. Some 10,000 were built by Gibbs and under licence in the next 15 years! 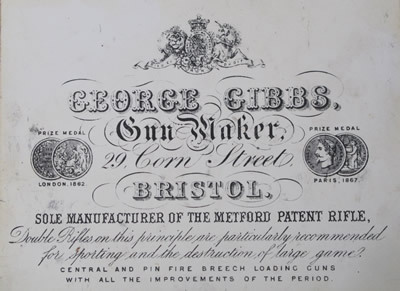 The help of W’m Metford in the design of special filing jigs helped Gibbs build a factory at St. Johns Bridge capable of producing over 300 hand made guns and rifles a year. 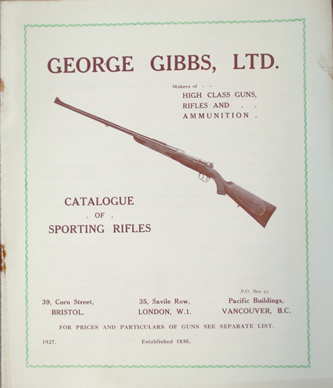 In the 20th century the design of the .256 Gibbs Magnum and .505 Magnum cartridges cemented Gibbs reputation as first class rifle makers. 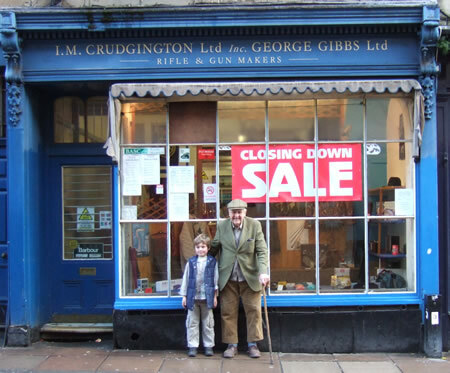 Despite falling victim to the 1929 crash and being bombed in 1940 the firm was eventualy bought up in the 1960’s by the Bath Gunmaker and author I.M.Crudgington who in turn sold the firm to his son Mark Crudgington in 2007. 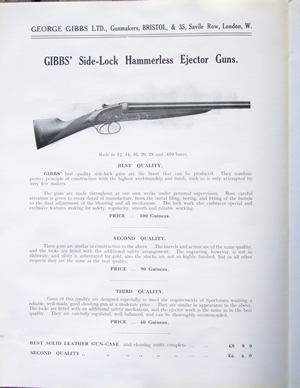 George Gibbs Ltd have produced best hand made guns and rifles continuously from 1835 to the present day. Born in 1963 Mark could be described as a real “son of a gun”. Brought up near Bath some of his earliest memories are of accompanying his father Ian , shooting and watching in wonder as everything from flintlocks to .505 magnums were shot or tested. Visiting W’m Keith . Neal at Bishopstrow house and looking at the finest private collection of antique firearms ever assembled or pigeon shooting with Chris Cradock were important stepping stones provided by his father that led to Mark starting his apprenticeship at his fathers firm of I.M.Crudgington Ltd in 1979. After completing his apprenticeship Mark went to The London Gun Company where he worked for Doug and Shirley Florent, he then moved to J.Rigby & Co. in Covent Garden under the direction of Paul Roberts where he worked with the likes of , Mark Remnant , Paul Willis , Mike Rainback ,the late Ron Wharton and the late great David Perkins, honing his skills in rifle making.Paul Roberts helped many young gunmakers , to gain improved skills , by providing a constant flow of new guns and rifles to work on and we are all very grateful for the opportunities provided. 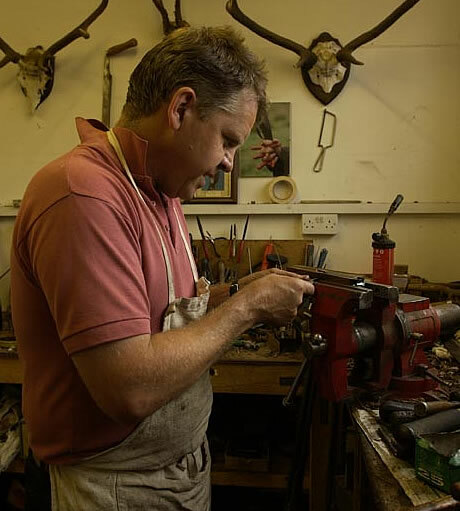 Returning to Bath in 1986 Mark has been an independent gun and rifle maker until his purchase of George Gibbs Ltd. in 2007 and is now based on a beautiful farm near Marlborough in Wiltshire.